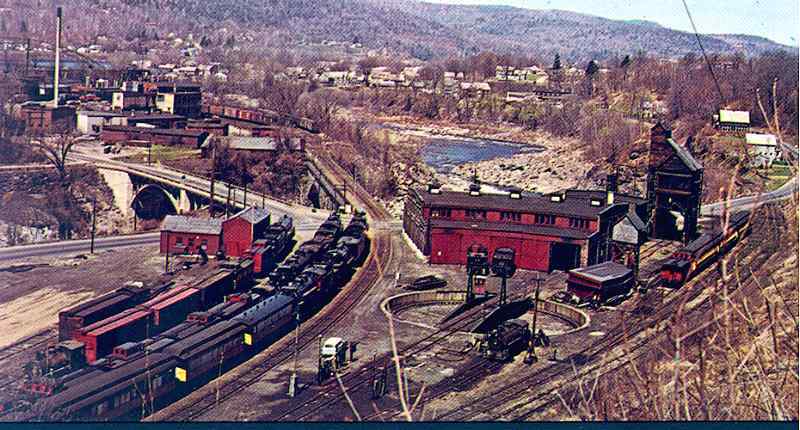 Before there was Steamtown National Historic Site in Scranton, PA, there was Steamtown U.S.A. in Bellows Falls, VT. Steamtown U.S.A. was owned and operated by Nelson Blount and the Bellows Falls location was not the first. Tragedy struck in 1967 when Nelson Blount was killed when his private plane crashed into a tree in Marlborough, NH. Nelson was only 49. This event took a lot of steam out of Steamtown U.S.A. Most of the operational steam locomotives were either sold or fell into disrepair. Then, in 1970, Vermont passed air quality regulations which prohibited steam operations. Diesel locomotives were then used on Steamtown U.S.A. excursions and ridership fell dramatically. Despite the air quality regulations, the Steamtown Foundation again began operating with a steam locomotive. By 1983, Steamtown U.S.A. again had many (six) operating steam locomotives. If it were not for Mr. Nelson Blount amassing the incredible collection of steam locomotives he did, we would not have many of the operating locomotives and museums we do have today. The following photographs show the collection when it was displayed at Riverside, just north of Bellows Falls, VT. Note: At one time, there was another English or Irish tank locomotive at Steamtown. It too was returned to the UK. Steamtown provided a "safe haven" for both until they could be returned and restored. Take a close look at the locomotive in the distance far to the right in this photo. It is Norfolk & Western 1218 prior to its return to excursion service on the Norfolk Southern. When Nelson Blount got 1218 from Union Carbide in the 1960s, the 1202 and 1208 were stripped of parts and scrapped. those parts were used to make 1218 complete. Over the years many locomotives have come and gone from Steamtown. The photos above contain a few of these locomotives. The list below shows many former Steamtown locomotives and where they are today. Canadian National 4-6-0 #1551 (sister to 1395) traded to the owner of the Ohio Central Railroad in exchange for Baldwin Locomotive Works 0-6-0 #26. Cavan & Lietrim Ry (Ireland) 3' gauge 2-6-2T was donated by owner Edgar Mead to preservation society in Ireland and returned home. Canadian National 2-6-0 #96 was sent from Bellows Falls to Scranton but never made it. It went only as far as Binghamton, NY when it was traded to a private owner from Canada in deal to get DL&W #565. 96 was later sold to the Ohio Central Railroad. It is currently stored and in pretty rough shape. Canadian National 2-6-0 #89 ownership passed to Blount's Green Mountain Railroad (it was never Steamtown property) along with CPR 4-6-2s 1246 and 1293. The ownership of #1246 and #1293 went to the Steamtown Foundation and #89 was sold to the Strasburg Railroad in 1972. 1293 now operates on the Ohio Central Railroad. 1246 is now located at the Railroad Museum of New England, Waterville, CT.
N&W 1218 was traded to Norfolk Southern for two diesels in 1985. London & Southwestern British 0-4-4T #53 sold in 1986 and returned home. Southern RY (of England) British "Schools" class 3-cylinder 4-4-0 #926 "Repton" was used a few times at Scranton during the Summer of 1986. It was later sold and returned home to the North Yorkshire Moors Railway in Grosmont, N. Yorkshire, UK. I had a opportunity to ride behind her at the North Yorkshire Moors Railway in 1997. That day I believe we had at least 8 BR standard coaches and she hauled them like a trooper only slipped a couple of times. When this loco ran in the states it was notorious for slipping and could barely pull two coaches. When operated at Scranton it was always run with the "pup" (their SW9). The folks in Britain I talked to indicated all they did was re-profile the drivers, but I would think the spring rigging must have been adjusted as well. The Repton is a great steamer and I was happy to see here back in her native habitat. Canadian Pacific 4-6-2 #1278 was traded with cash to the Gettysburg Railroad for Canadian National 2-8-2 #3254 in 1986. 1278 is now at the Age of Steam Roundhouse. Canadian Pacific 4-6-0 #1098 was sold to George Hart and restored in Jim Thorpe, PA. It was operated by Rail Tours Inc. during Sep-Oct 1994 and then stored. The latest information indicates that they are looking for a new "steam person". Canadian Pacific 4-6-2 #1246 was sold to the Connecticut Valley Railway Museum (now Railroad Museum of New England). Canadian National 4-6-0 #1395 (sister of 1551) was sold to a private owner in Coopersville, MI. Currently 1395 is at the Coopersville & Marne Railway. Massachusetts Electric 0-4-0T #1 was sold to a private owner. It is now in an industrial park in Oaks, PA.
New Haven Trap Rock 0-4-0T #38 (sister #43 still in collection) was sold. Today, #38 is being restored and is kept inside a building in Branford, CT. It was recently inspected and is looking good. An unusual (vertical boilered) 1877 Belgian 0-4-0T, the "Prince of Liege" was sold to a private owner and at last report was displayed near a railroad station in Great Bend, PA.
Union Pacific 4-4-0 #737 was once offered in trade for DL&W Camelback #952 at the Museum of Transportation in St. Louis. It was later sent to the Nevada State Railroad Museum. From there it went to Portola. It is now located at the Double T in Stevenson, CA. Canadian Pacific Railway 4-6-4 2816 was acquired by the Canadian Pacific Railway.